If you are visiting or working in Cleveland during the Republican National Convention, July 18-21, 2016, this page is for you. For questions that are not answered here, call the RTAnswerline, 216-621-9500. The Answerline is staffed from 7 a.m.-6 p.m. Monday-Friday, and 8 a.m.-4:30 p.m. Saturday. For up-to-date information, customers can like RTA on Facebook, follow RTA on Twitter, and subscribe to Commuter Alerts. All RTA services will be available during the Convention. RTA's Red Line offers direct service between Cleveland Hopkins International Airport and the Tower City Station -- Downtown's central rail hub. The rail station is in the Airport's lower level -- you never have to go outside. RTA's four rail lines all serve the Tower City Station. Rail service will be normal on all days. Service will be available to handle additional passengers. RTA offers a special 7-Day Pass -- $20 for unlimited rides during Convention Week only, July 17-23. Buy a Convention Pass at RTA's Customer Service Center at the Tower City Station. Other fare media is sold at Red Line and HealthLine stations -- just look for the red ticket vending machines. Buy fare media at these sites. Use a new mobile ticketing app on your cell phone to buy a Convention Pass, and All-Day, 7-Day and Monthly Passes for adults, as well as the Senior/Disabled version at a lower price. These tips should make your travel plans smoother. Each morning, check Service Alerts for traffic and service updates. Plan your route, using RTA's easy on-line trip planner. Bus service may be impacted by traffic congestion. RTA rail service may be your best alternative. The Waterfront Line will be shut down on Sunday, July 17, for a Convention-related event. When possible, buy fare media on-line. Here is a Map to explain RTA's services for Convention Week. Trolleys are your best bet for getting around. Thanks to the generous donation of the Host Committee and Destination Cleveland, RTA is offering expanded trolley service during the Convention. And, thanks to RTA's Downtown business partners, the trolley is always free with a smile. From Sunday-Thursday, July 17-21, RTA offers expanded trolley service from 5 a.m.-1 a.m., with service every 5 minutes instead of every 10 minutes. Just look for the decorative trolley stop signs, and listen for the ding! ding! ding! Learn more. After 8 p.m. Friday, July 15, and all day Saturday, July 16, the C-Line will be on re-route. (See Service Alerts). The C-Line trolley will not operate on Sunday, July 17. The B-Line and E-Line will operate from 11 a.m.-1 a.m. The B-Line will use its July 18-21 re-route. See Map(link is external). The 9/12 Trolley will use the July 18-22 re-route. See Map(link is external). 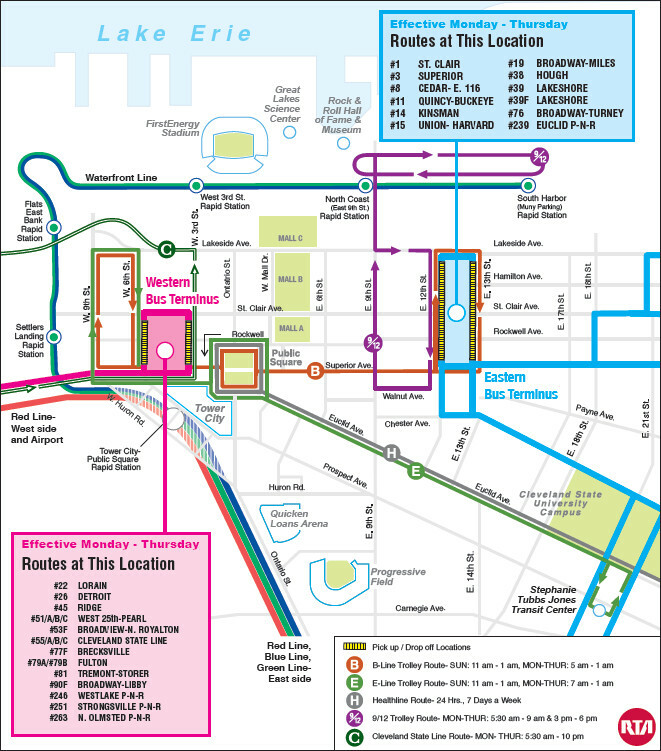 B-Line Trolley will operate on a special re-route that connects the Eastern and Western Bus Terminals. See Map. E-Line Trolley will operate from 7 a.m.-1 a.m., at higher frequency, on its regular route. C-Line Trolley will not operate. 9/12 Trolley will operate its regular schedule on a slightly different route. See Map(link is external). This state-of-the-art bus rapid transit (BRT) system draws attention from around the world. The HealthLine operates 24/7, and serves Public Square(link is external), Playhouse Square(link is external), Cleveland State University(link is external), and Euclid Avenue to University Circle(link is external), Cleveland's cultural diamond. Learn more about this service. Because key streets will be closed, RTA's regular bus routes will be modified Downtown. Transit hubs will be setestt up on the east and west sides of Downtown. Buses can still enter Downtown, but must avoid the Security Zone. This Map will show where to connect with your bus at each hub. The Greater Cleveland Regional Transit Authority (RTA) is providing you with links to stories and information that will help you have a better understanding of RTA services and why RTA was named The Best Large Public Transit System in North America. Why is the HealthLine a world-class service? Click here to find out. Fact sheet on RTA's trolleys -- a transit success story. Would you like a tour? Learn more about Joe Calabrese, RTA's veteran CEO & General Manager. What the national media is saying about Cleveland.